Retail building in prime location at intersection of Merrimon Ave and Coleman Ave. One-story building featuring 10,064 total sq ft (2,040 air-conditioned retail and 8,024 heated storage space). Storage space is heated with two gas, gymnasium ceiling heaters. Two restrooms available. Parking lot includes twenty spaces. Garage door access with ground level loading access. Building sits on lot with 104 frontage feet on Merrimon Ave., 202.44 feet deep, .49 acres. Lease is triple net. Directions: From downtown, take Merrimon Avenue north (US Hwy 25); 400 Merrimon is on left, just past Coleman Avenue. 0 Tingle Alley; 3311 sq feet; $1250/mo. Ideal for storage space, large room measuring 43 x 77 and approximately 3,311 sq ft. Unheated, unfinished. Directions: Merrimon Ave into town, stay straight on Broadway, turn right on Tingle Alley. 697 Haywood Road; 1960 square feet; $2450/mo. Measurements are 40′ x 49′. No windows other than the glass doors at entrance. Two bathrooms and a rear exit. Two gymnasium style gas heaters, it also appears to have one heat pump. Strip shopping center in prime West Asheville location. Built in 1966 w/ approx 11,592 total sf, this bldg is currently divided into seven row retail stores. Tenant pays all utilities – gas, w/s, elec, garbage; they also pay cable, phone, etc, if they wish to have those services. Directions: From downtown, I-240W to West Asheville Exit (Exit 2), right at exit onto Haywood Rd, bldg is a short distance on the right. 44 Merrimon Avenue, Suite 1; $4,000/mo. 2-story office building; retrofitted with new mechanicals, A/C, gas heat and wood floors. Ample parking. 2,400 sq. ft. Tenant pays gas (heat) and electric. Directions: From town, Merrimon Avenue north, #44 is on corner of Merrimon and Marcellus on left. First Bank Building, 79 Woodfin Street; $1,695/mo. Great first-floor office space in very convenient location in First Bank Building on Woodfin Place. 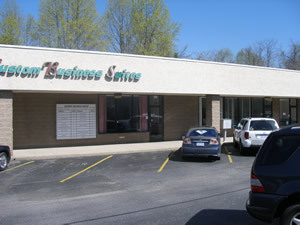 Offices include 926 sf; all utilities, janitorial, and ample parking included. Central heat and air. Common restrooms right around the corner. Directions: From I-240 East, take Charlotte Street exit, go straight through intersection; bldg is on right. From downtown, turn onto Charlotte Street, right on Woodfin Place/I-240 East; bldg is on right. Located next to the Publix’s Shopping Center in Skyland, NC. Convenient location on heavily-traveled Hendersonville Road. Ample parking, common kitchenette and restrooms, furniture available on a limited basis. 1 year gross lease. Landlord pays for parking, heating, cooling, lights, janitorial. Suite T – One room. All utilities, janitorial and parking included in rent. $245/mo. 9 X 12.5. Available: May 1st. Located at 70 Woodfin Place and Charlotte Street, at the intersection of Charlotte Street and I-240. Formally the Memorial Mission Hospital building, this building features twelve foot ceilings, free parking located around the building, some units have great views of downtown Asheville or Sunset Mountain, and also features a new deck lounge. All leases are one year, all utilities are included and janitorial services are provided. Ample free parking located adjacent to the building. AT&T provides fiber optic internet service at additional charge. This section of Woodfin Place is also the entrance road for I-240 east off of Charlotte Street. Immediate access to I-240.